One of the most recognizable poker players on the tour, Phil Hellmuth, also known as the “Poker Brat”, has produced some of the most explosive rants in the game after losing a hand. Despite being regarded as one of the best readers of the game, Hellmuth has at times been caught off guard by his opponent. Hellmuth doesn’t care whether you’re an amateur or a professional poker player, if you beat him, you’re more than likely to be on the receiving end of one of Phil’s foul-mouthed rants. If you’d rather steer clear of encountering a Hellmuth rant against you, then perhaps blackjack is the casino game for you. You can try it out here- https://casino.paddypower.com/c/blackjack. Cristian Dragomir’s encounter with the poker brat at the 2008 World Series of Poker is a moment no one should miss. With the ten and four of diamonds in his hand, Romanian Dragomir raises to $80k, while Hellmuth, with an off suit ace king raises to $255k. Dragomir takes his time before calling. The flop produces a nine, a ten and a seven, putting the odds in the Romanian’s favor. He capitalizes on his top pair by betting $300k, which is where Hellmuth begins to unleash his wrath, calling his opponent an idiot before folding, predicting that Dragomir has ace queen. The commentator described the win and reaction as “worth the price of admission”, and Hellmuth and Dragomir began some verbal sparring. Hellmuth continued to him an idiot, but Dragomir hit back saying “I’m an idiot with a stack, you don’t have a stack.” The other players and the crowd continue to laugh at the outburst as Hellmuth called him the worst player in the history of poker. In the first season of Poker After Dark, Hellmuth was up against Annie Duke, Sheiky and Gus Hansen. Hellmuth was dealt ace ten, while Duke has pocket kings. Before the flop was even turned over the poker brat lost his cool. Complaining that his opponents kept talking while he was trying to make a big decision as to whether to call Duke’s re-raise. He called over one of the executive producers to ask for a penalty to be introduced for people who kept talking while someone was trying to make a big decision. Phil went on a foul-mouthed rant and eventually folded before the flop was drawn. Tom Dwan made one of his first televised appearances when he took on Phil Hellmuth one on one at the NBC National Heads-Up Poker Championship. In what was a classic old school versus new school match, the third hand between the pair saw Hellmuth dealt pocket aces, spades and diamonds, while Dwan had pocket tens, hearts and clubs. 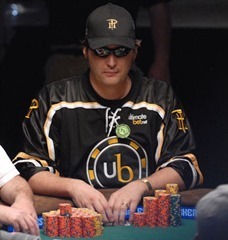 The young American internet poker star raise to $1,100, before Hellmuth quickly re-raised to $3,600. Dwan responded to Hellmuth’s re-raise by going all-in at $20k and the experienced pro called immediately. Although the odds were in Hellmuth’s favor, without seeing even the flop, anything was possible. The flop was dealt and the two of spades, king of hearts and the seven of spades were revealed. The chance of a flush only improved Hellmuth’s chances of winning the hand, before the turn produced the ten of spades. Dwan was not in the driving seat, but if there was a spade or an ace on the river, Hellmuth would send Dwan home. A nine of diamonds was shown on the river and Dwan defeated the poker brat but was then subject of a famous Hellmuth rant telling Dwan “We’ll see if you’re still around in five years.” Although he doesn’t compete in American poker tournaments anymore, you can still find him in Manila and Macau in the super high rollers.